Botánicas such as this one in Jamaica Plain, Boston, cater to the Latino community and sell folk medicine alongside statues of saints, candles decorated with prayers, lucky bamboo, and other items. Traditional medicine (also known as indigenous or folk medicine) comprises medical aspects of traditional knowledge that developed over generations within various societies before the era of modern medicine. 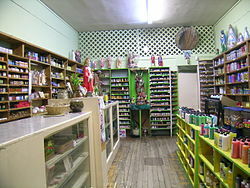 The World Health Organization (WHO) defines traditional medicine as "the sum total of the knowledge, skills, and practices based on the theories, beliefs, and experiences indigenous to different cultures, whether explicable or not, used in the maintenance of health as well as in the prevention, diagnosis, improvement or treatment of physical and mental illness". Traditional medicine is contrasted with scientific medicine. In some Asian and African countries, up to 80% of the population relies on traditional medicine for their primary health care needs. When adopted outside its traditional culture, traditional medicine is often considered a form of alternative medicine. Practices known as traditional medicines include traditional European medicine, traditional Chinese medicine, traditional Korean medicine, traditional African medicine, Ayurveda, Siddha medicine, Unani, ancient Iranian Medicine, Iranian (Persian), Islamic medicine, Muti, and Ifá. Scientific disciplines which study traditional medicine include herbalism, ethnomedicine, ethnobotany, and medical anthropology. 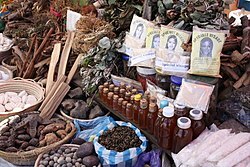 The WHO notes, however, that "inappropriate use of traditional medicines or practices can have negative or dangerous effects" and that "further research is needed to ascertain the efficacy and safety" of several of the practices and medicinal plants used by traditional medicine systems. Ultimately, the World Health Organization has implemented a nine year strategy to "support Member States in developing proactive policies and implementing action plans that will strengthen the role traditional medicine plays in keeping populations healthy." In the written record, the study of herbs dates back 5,000 years to the ancient Sumerians, who described well-established medicinal uses for plants. In Ancient Egyptian medicine, the Ebers papyrus from c. 1552 BC records a list of folk remedies and magical medical practices. The Old Testament also mentions herb use and cultivation in regards to Kashrut. Many herbs and minerals used in Ayurveda were described by ancient Indian herbalists such as Charaka and Sushruta during the 1st millennium BC. The first Chinese herbal book was the Shennong Bencao Jing, compiled during the Han Dynasty but dating back to a much earlier date, which was later augmented as the Yaoxing Lun (Treatise on the Nature of Medicinal Herbs) during the Tang Dynasty. Early recognised Greek compilers of existing and current herbal knowledge include Pythagoras and his followers, Hippocrates, Aristotle, Theophrastus, Dioscorides and Galen. Roman sources included Pliny the Elder's Natural History and Celsus's De Medicina. Pedanius Dioscorides drew on and corrected earlier authors for his De Materia Medica, adding much new material; the work was translated into several languages, and Turkish, Arabic and Hebrew names were added to it over the centuries. Latin manuscripts of De Materia Medica were combined with a Latin herbal by Apuleius Platonicus (Herbarium Apuleii Platonici) and were incorporated into the Anglo-Saxon codex Cotton Vitellius C.III. These early Greek and Roman compilations became the backbone of European medical theory and were translated by the Persian Avicenna (Ibn Sīnā, 980–1037), the Persian Rhazes (Rāzi, 865–925) and the Jewish Maimonides. Some fossils have been used in traditional medicine since antiquity. Arabic indigenous medicine developed from the conflict between the magic-based medicine of the Bedouins and the Arabic translations of the Hellenic and Ayurvedic medical traditions. Spanish indigenous medicine was influenced by the Arabs from 711 to 1492. Islamic physicians and Muslim botanists such as al-Dinawari and Ibn al-Baitar significantly expanded on the earlier knowledge of materia medica. The most famous Persian medical treatise was Avicenna's The Canon of Medicine, which was an early pharmacopoeia and introduced clinical trials. The Canon was translated into Latin in the 12th century and remained a medical authority in Europe until the 17th century. The Unani system of traditional medicine is also based on the Canon. Translations of the early Roman-Greek compilations were made into German by Hieronymus Bock whose herbal, published in 1546, was called Kreuter Buch. The book was translated into Dutch as Pemptades by Rembert Dodoens (1517–1585), and from Dutch into English by Carolus Clusius, (1526–1609), published by Henry Lyte in 1578 as A Nievve Herball. This became John Gerard's (1545–1612) Herball or General Hiftorie of Plantes. Each new work was a compilation of existing texts with new additions. Women's folk knowledge existed in undocumented parallel with these texts. Forty-four drugs, diluents, flavouring agents and emollients mentioned by Dioscorides are still listed in the official pharmacopoeias of Europe. The Puritans took Gerard's work to the United States where it influenced American Indigenous medicine. Francisco Hernández, physician to Philip II of Spain spent the years 1571–1577 gathering information in Mexico and then wrote Rerum Medicarum Novae Hispaniae Thesaurus, many versions of which have been published including one by Francisco Ximénez. Both Hernandez and Ximenez fitted Aztec ethnomedicinal information into the European concepts of disease such as "warm", "cold", and "moist", but it is not clear that the Aztecs used these categories. Juan de Esteyneffer's Florilegio medicinal de todas las enfermedas compiled European texts and added 35 Mexican plants. Martín de la Cruz wrote an herbal in Nahuatl which was translated into Latin by Juan Badiano as Libellus de Medicinalibus Indorum Herbis or Codex Barberini, Latin 241 and given to King Carlos V of Spain in 1552. It was apparently written in haste and influenced by the European occupation of the previous 30 years. Fray Bernardino de Sahagún's used ethnographic methods to compile his codices that then became the Historia General de las Cosas de Nueva España, published in 1793. Castore Durante published his Herbario Nuovo in 1585 describing medicinal plants from Europe and the East and West Indies. It was translated into German in 1609 and Italian editions were published for the next century. In 17th and 18th-century America, traditional folk healers, frequently women, used herbal remedies, cupping and leeching. Native American traditional herbal medicine introduced cures for malaria, dysentery, scurvy, non-venereal syphilis, and goiter problems. Many of these herbal and folk remedies continued on through the 19th and into the 20th century, with some plant medicines forming the basis for modern pharmacology. The prevalence of folk medicine in certain areas of the world varies according to cultural norms. Some modern medicine is based on plant phytochemicals that had been used in folk medicine. Researchers state that many of the alternative treatments are "statistically indistinguishable from placebo treatments". Traditional medicine may sometimes be considered as distinct from folk medicine, and the considered to include formalized aspects of folk medicine. Under this definition folk medicine are longstanding remedies passed on and practiced by lay people. Folk medicine consists of the healing practices and ideas of body physiology and health preservation known to some in a culture, transmitted informally as general knowledge, and practiced or applied by anyone in the culture having prior experience. Many countries have practices described as folk medicine which may coexist with formalized, science-based, and institutionalized systems of medical practice represented by conventional medicine. 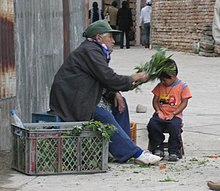 Examples of folk medicine traditions are traditional Chinese medicine, traditional Korean medicine, Arabic indigenous medicine, Uyghur traditional medicine, Japanese Kampō medicine, traditional Aboriginal bush medicine, and Georgian folk medicine, among others. American Native and Alaska Native medicine are traditional forms of healing that have been around for thousands of years. A home remedy (sometimes also referred to as a granny cure) is a treatment to cure a disease or ailment that employs certain spices, vegetables, or other common items. Home remedies may or may not have medicinal properties that treat or cure the disease or ailment in question, as they are typically passed along by laypersons (which has been facilitated in recent years by the Internet). Many are merely used as a result of tradition or habit or because they are effective in inducing the placebo effect. One of the more popular examples of a home remedy is the use of chicken soup to treat respiratory infections such as a cold or mild flu. Other examples of home remedies include duct tape to help with setting broken bones; and duct tape or superglue to treat plantar warts; and Kogel mogel to treat sore throat. In earlier times, mothers were entrusted with all but serious remedies. Historic cookbooks are frequently full of remedies for dyspepsia, fevers, and female complaints. Components of the aloe vera plant are used to treat skin disorders. Many European liqueurs or digestifs were originally sold as medicinal remedies. In Chinese folk medicine, medicinal congees (long-cooked rice soups with herbs), foods, and soups are part of treatment practices. Although 130 countries have regulations on folk medicines, there are risks associated with the use of them. It is often assumed that because supposed medicines are herbal or natural that they are safe, but numerous precautions are associated with using herbal remedies. Sometimes traditional medicines include parts of endangered species, such as the slow loris in Southeast Asia. Endangered animals, such as the slow loris, are sometimes killed to make traditional medicines. Shark fins have also been used in traditional medicine, and although its use has not been proven, it is hurting shark populations and their ecosystem. ^ a b c "Traditional Medicine: Definitions". World Health Organization. 2008-12-01. Retrieved 2014-04-20. ^ "WHO traditional medicine strategy: 2014-2023". The World Health Organization. December 2013. ^ "Ebers' Papyrus". Retrieved 28 December 2014. ^ Girish Dwivedi, Shridhar Dwivedi (2007). History of Medicine: Sushruta – the Clinician – Teacher par Excellence (PDF). National Informatics Centre. Retrieved 2008-10-08. ^ a b c d e Kay, MA (1996). Healing with plants in the American and Mexican West. Tucson: University of Arizona Press. pp. 19–20. ISBN 978-0-8165-1646-9. ^ a b c Raphael, Sandra; Blunt, Wilfrid (1994). The Illustrated herbal. London: Frances Lincoln. ISBN 978-0-7112-0914-5. ^ Slikkerveer, L. J. (1990). Plural medical systems in the Horn of Africa: the legacy of "Sheikh" Hippocrates. London: Kegan Paul International. ISBN 978-0-7103-0203-8. ^ García Sánchez, E; Carabaza Bravo, JM; Hernández Bermejo, JE; Ramírez, AJ (1990). "Árboles y arbustos en los textos agrícolas andalusíes (I)". In e Morales Ruiz Matas CA. Ciencias de la naturaleza en Al-Andalus : textos y estudios (in Spanish). Consejo Superior de Investigaciones Científicas. ISBN 978-84-00-07727-3. ^ Fahd, Toufic (1996). "Botany and agriculture". In Rashed, Roshdi; Morelon, Régis. Encyclopedia of the History of Arabic Science. Routledge. p. 815. ISBN 978-0-415-02063-3. ^ Tschanz David W (2003). "Arab Roots of European Medicine". Heart Views. 4: 2. ^ Eldredge Jonathan D (2003). "The Randomised Controlled Trial design: unrecognized opportunities for health sciences librarianship". Health Information and Libraries Journal. 20: 34–44 . doi:10.1046/j.1365-2532.20.s1.7.x. ^ Ortiz de Montellano, B (1975). "Empirical Aztec medicine". Science. 188 (4185): 215–20. doi:10.1126/science.1090996. PMID 1090996. ^ Lozoya, Xavier (2016). "Libellus de Medicinalibus Indorum Herbis (Librito de las yerbas medicinales de los indios) o Códice Badiano". Arqueología Mexicana. ^ Swerdlow JL. Medicine Changes: late 19th to early 20th century. Nature's Medicine: Plants that Heal. Washington, D.C.: National Geographic Society; 2000. pp. 158–91. ^ Ansari J.A., Inamdar N.N. (2010). "The Promise of Traditional Medicines". International Journal of Pharmacology. 6 (6): 808–812. doi:10.3923/ijp.2010.808.812. ^ Bakx Keith (1991). "The 'eclipse' of folk medicine in western society". Sociology of Health and Illness. 13: 20–38. doi:10.1111/1467-9566.ep11340307. ^ The Economist, "Alternative Medicine: Think yourself better", 21 May 2011, pp. 83–84. ^ Acharya, D; Anshu S (2008). Indigenous Herbal Medicines: Tribal Formulations and Traditional Herbal Practices. Jaipur: Aavishkar Publishers. ISBN 978-81-7910-252-7. ^ Maurice Mwu, Eric Gbodossou (December 2000). "ALTERNATIVE MEDICINE: NIGERIA The role of traditional medicine" (PDF). The Lancet. ^ Laguerre, Michel S. (1987). Afro-Caribbean folk medicine. New York: Bergin & Garvey. ISBN 978-0-89789-113-4. ^ Acharya, Deepak and Shrivastava Anshu (2008): Indigenous Herbal Medicines: Tribal Formulations and Traditional Herbal Practices, Aavishkar Publishers Distributor, Jaipur- India. ISBN 978-81-7910-252-7. pp 440. ^ "Traditional, complementary and integrative medicine". World Health Organization. 2018. Retrieved 7 May 2018. ^ "WHO Traditional Medicine Strategy 2014-2023" (PDF). World Health Organization. 2013. Retrieved 7 May 2018. ^ "Placebo Effect: A Cure in the Mind". Scientific American. February–March 2009. ^ Catherine Esther Beecher Mrs. Beecher's Housekeeper and Healthkeeper 1874. Retrieved on 2007-11-05. ^ Sidgwick, G. P; McGeorge, D; Bayat, A (2015). "A comprehensive evidence-based review on the role of topicals and dressings in the management of skin scarring". Archives of Dermatological Research. 307 (6): 461–477. doi:10.1007/s00403-015-1572-0. PMC 4506744. PMID 26044054. ^ "National Policy on Traditional Medicine and Regulation of Herbal Medicines - Report of a WHO Global Survey". World Health Organization. April 2016. ^ Starr, C.; Nekaris, K. A. I.; Streicher, U.; Leung, L. K. -P. (2011). "Field surveys of the Vulnerable pygmy slow loris Nycticebus pygmaeus using local knowledge in Mondulkiri Province, Cambodia" (PDF). Oryx. 45 (1): 135–142. doi:10.1017/S0030605310001316. ^ "Traditional medicines continue to thrive globally - CNN.com". www.cnn.com. Retrieved 2016-04-25.